Guess Who Would Have Been 50 This Month? Nine days ago there was a birthday that went largely unacknowledged. On August 11, 1965, a legend was born that would go down in history as one of the most influential of its kind. This legend helped found an all-new category of vehicle and established itself as a forerunner of all others to exist since. Unfortunately, like too many other world-influencing figures, this legend died an early death. That was in 1996, and even today rumors abound that it’s not really dead, just hibernating and waiting for the right time to return to Earth. August 11, 2015, would have been the 50th birthday of the great Ford Bronco. The Bronco was Ford’s first compact SUV and competed with the Jeep CJ5 and the International Scout. It gained an immediate following but fell behind in the sales race to the Chevrolet Blazer and International’s Scout II. 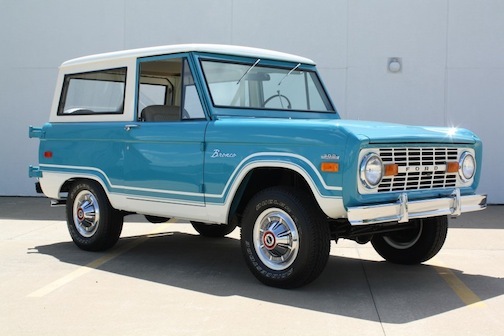 Ford created the second-generation Bronco in 1978, which was closer to the size of the Blazer. It received mild updates and changes in safety features and powertrain options, but the style remained largely unchanged until its death in 1996. The Bronco was replaced by the Expedition, which had four doors and allowed Ford to compete with Chevrolet’s growing line of full-size SUVs. Those early Broncos are the ones collectors love and miss the most, and while rumors of a Bronco comeback have never come to fruition, at least one company has turned the dream into reality for Bronco-lovers who have grown up and amassed plenty of wealth. ICON, a California customizer of old Toyota, Jeep, and Ford SUVs, has a version of the Bronco that has sentimental fans clamoring for more. The Icon is an intensely reworked 1966 to 1975 Ford Bronco fortified with parts from the hot-rod, mining, marine, and aircraft industries to achieve a sort of 4×4 transcendence. It’s the utility vehicle that Ford might build if government regs didn’t exist and it could charge $190,000 for a small two-door SUV. Yes, the ICON Bronco can cost close to $200,000, not including the cost to acquire the donor Bronco. Is it worth the price? Will there ever be a Ford-built modern reincarnation of the Bronco? Probably not. But buy a used one, take care of it, and you’ll do your part to keep the Bronco’s spirit alive forever. Do you want to see the Ford Bronco reborn as a modern SUV? This entry was posted in Car Minded, Classic & Vintage Cars, Domestic Cars, General Chat, Trucks & SUVs, United States and tagged Ford Bronco, ford bronco 50th birthday, icon ford bronco, new ford bronco. Bookmark the permalink.